Dr. Kaufman’s Pain Neutralization Technique (PNT), is an advanced modality which treats chronic and acute pain, as described by Dr. Jonathan Wright. This therapy uses the relationship between complementary and opposite muscles and their reflexes, as well as the body’s energy lines and dermatomes, in order to release the pain from a specific area. The pain release or neutralization is done without deep pressure, but with a lighter touch. Most people are pleasantly surprised by this technique. 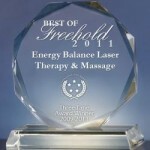 Massage for Stress Relief offered at Freehold Spa. Courtesy of ABMP.